Support American Soccer! Great Family Fun. On Saturday my family headed to Harrison, New Jersey to watch the New York Red Bulls take on Philadelphia Union. The Red Bulls won 2-1. It was a great game. I was initially a little worried about taking Emory to a place where he might need to sit still for longer than 10 minutes. I was pleasantly surprised by how well behaved he was! Not only did he sit relatively still, but he actually watched the game. We had an excellent time. It was a wonderful day. That’s why I’m writing today. I should mention upfront that I’m not getting free tickets for writing this or anything of the sort. I’m writing this because short of begging, I’m not sure what else to do to get more people to realize what it is they’re missing—especially those with children; you’re missing out on something awesome. 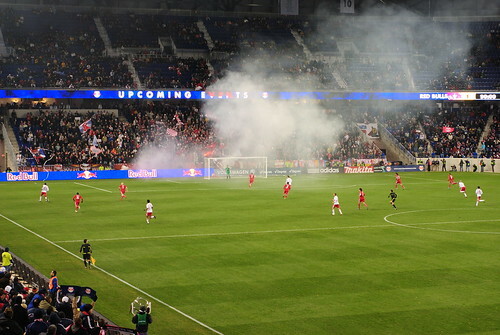 I had no idea how family-friendly Red Bull Stadium would be! So, I’m guessing that others might not be aware of it either. My kid loves choo-choos but I was still concerned about getting to and from the game. It was a cinch. 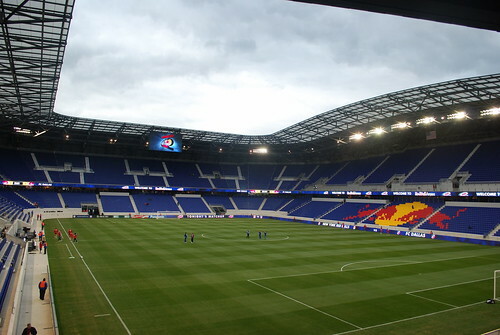 This was my second visit to Red Bull Stadium; the first time I went alone. Each time getting there and back has been a breeze. I live in Brooklyn, so I have to go through Manhattan and then into New Jersey. The whole trip took less than a hour. That includes walking to and from the subway/Path. The trip back takes even less time because New Jersey Transit has extra trains lined up for immediately following the game. I was impressed with how easy it was to board the Path train on our way home. They really have it figured out. For the first game, I was back within 40 minutes. Yesterday we got back in 50—and that’s because I can barely walk these days given the stress fracture and all. Point is: it’s well worth the commute. And if you have little people, there’s not much in the way of walking. The longest walk is from the Path train to the stadium where you have to walk two blocks. I was floored by how many children there were at this game. Seriously. There were babies ranging from newborns dangling from their parent’s chest; there were kids my son’s age—between 2 and 3. There were kids everywhere. No joke. I haven’t seen that many kids in one place since we left Disney. (Worry not my kidless friends, there’s also a great deal of drinking, fun and fried food for those who couldn’t care less about the little people.) And if your tickets are nearby to the supporters’ section—as ours are—you’re in for an even bigger treat. The stadium is brand spanking new. It opened on March 27th. It’s super nice, clean. The bathrooms are spotless. It’s just nice. I’m not sure what more to say. 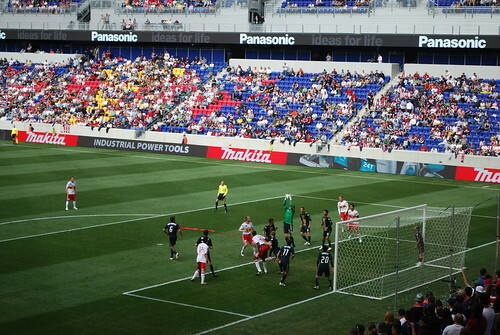 Tickets to a Red Bulls game are relatively cheap, in my opinion and well worth the fun. And the stadium is brand new, clean and accommodating. Tickets range anywhere from 20 dollars up to 45. 20 bucks! That’s totally worth it, I assure you. Yesterday was worth a great deal more to me than 20 bucks. There’s even a family pack where you get 4 tickets at a discounted price as well as 20 bucks credit to concession and/or merchandise. I just want to see more people come out and watch and support soccer. We have some great teams and they need our support. With the World Cup just around the corner, I think it’s time. It’s time to start America’s heart with the desire to watch and support soccer. Come out and join us! My brother has offered to buy everyone beer and fried food—everyone. ;] I’ll bring the Pepcid. Next Post Mom It Down: Chocolate Angel Food Cake: FAIL. With some stadiums these days nearly outlawing any kind of bag, you basically walked right through yesterday with your kid bag, didn’t you? Funny you mentioned it, we just drove by the stadium today and decided to check out the next game so we’ll be there on may 15th. Not sure if we should splurge a little for better seats or just go with the bleechers. Great pictures by the way! 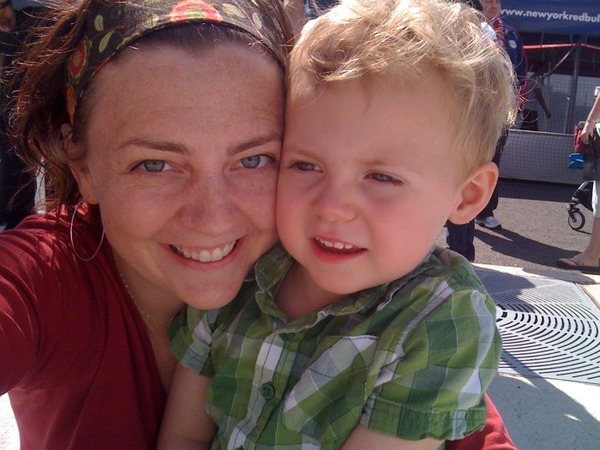 Love, love, love the picture of you and Emory. You guys look so much alike! I’m so glad you enjoyed a soccer match! As the world knows, we Brazillians are very familiar with soccer and we love it. Every time I went to a stadium, I had fun. It’s ALWAYS fun and children are everywhere. It would be great to see Americans at the World Cup and see you guys be so excited as the rest of the world is with the most popular sport in all time. @bambooska We already have a great group of fans here and I’m sure we’ll have a good showing at the World Cup (with respect to fans, at least). Unfortunately, we need wider support to continue growing the sport here so the US can someday regularly challenge the elite teams, rather than be just the dangerous underdog. @bkgunner, wouldn’t it be awesome if USA could really cheer for their team as a nation and be just as excited as the rest of us are in a World Cup? :) Oh, and why is soccer not so popular in the US? I never understood the reason. We are seeing our first ever MLS match this Saturday! Sounders v. Galaxy and we scored really awesome seats. Happy Mother’s Day to me! Go Sounders!